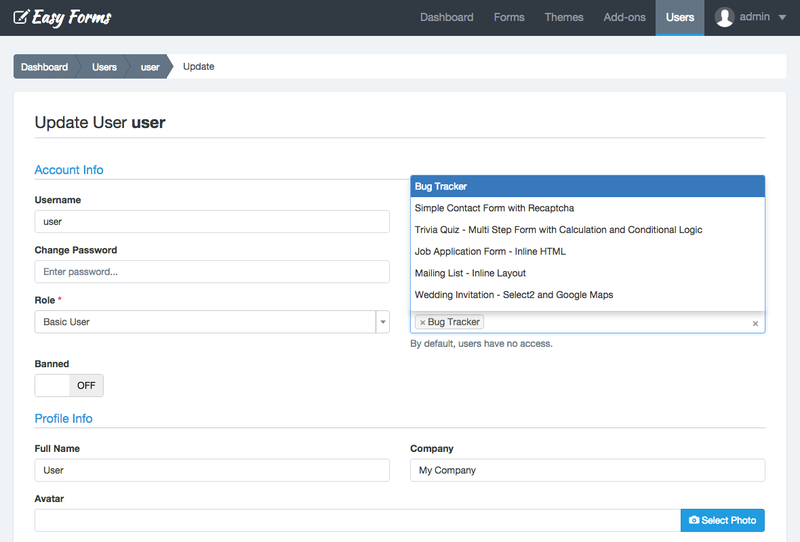 Easy Forms has a special area for managing users. Letting you create users who have only access to information collected by certain forms. 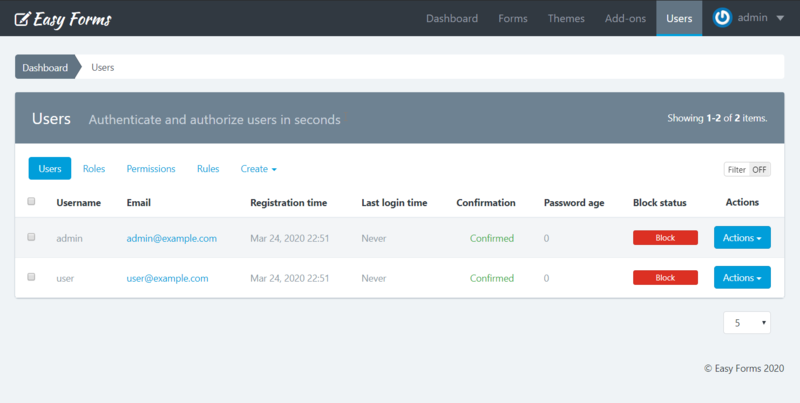 Admin: A user with access to the entire application, including site configuration, user management and all forms. Basic User: A user who can access the application but do not have access to any information. You should grant access to one or more forms in order to let him see the information. However, in any case, a user can create or manage forms, templates, themes, users or site configuration. This role has been created to allow your customers not only get notifications in their emails, but also access "Easy Forms" to get more information. Advanced User: Advanced users can create forms and manage them freely. And also they will be able to create their own themes and use them in their forms. Moreover, they can access the Template Manager to create their own templates and use templates created by administrators. Note: When you define the user status as 'Inactive', users must confirm their email before they can access the application. Click the Actions button of the User to edit. A pop-up window will appear asking for confirmation. You must click OK. User Manager will reload and the User will be deleted. Note: Please note that all user information will be deleted and cannot be recovered. Click the Actions button of the User you are going to grant/remove access. Click on the Grant access field and select one by one the forms that the user will access. Click the Actions button of the User you are going to ban. Note: When a banned user tries to log in, a message will appear informing his situation (the ban reason).